Tis-sa-ack is, along with Yosemite Falls and El Capitan, Yosemite Valley. The iconic rock stands high above the east end of the valley, rising to 8,839 feet (2,694 meters), just short of a vertical mile above the valley floor. It is perhaps the most instantly recognizable feature of the park. And one of the less understood features as well. Glaciation is often invoked as the origin of the unique shape of Half Dome, but glaciers only had a marginal role, as they never overtopped the dome. They only reached the base. A view from Washburn Point, a bit more to the south than Glacier Point. Both views are looking roughly east. 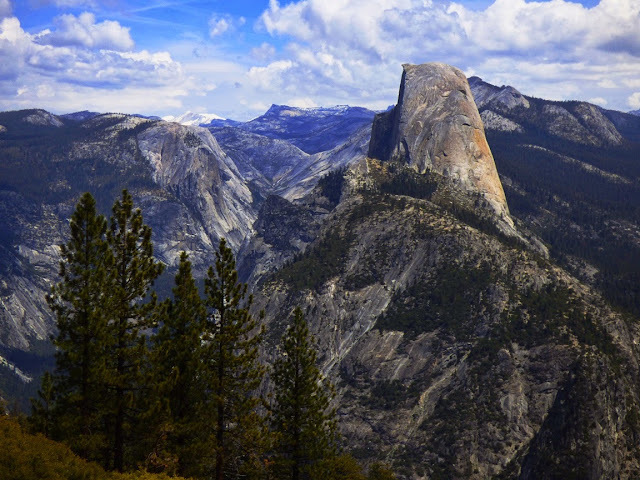 Half Dome is composed of a granitic rock called the Half Dome Granodiorite. The distinction of granite and granodiorite may be lost on some people, but here it is: both rocks contain the mineral quartz, but granodiorite has a somewhat higher proportion of plagioclase feldspar than it has of potassium feldspar. It will have a slightly higher proportion of mafic (dark) minerals like hornblende or biotite mica. But really, "granite" will suffice. Many of the granitic rocks of Yosemite Valley are highly jointed, meaning that the rocks fractured as they were exposed at the surface by erosion. Jointing is also influenced by regional stresses, such as nearby fault zones. Jointed rocks are easily quarried by glacial action, and in Yosemite Valley, such rocks form the recessed parts of the canyon walls. 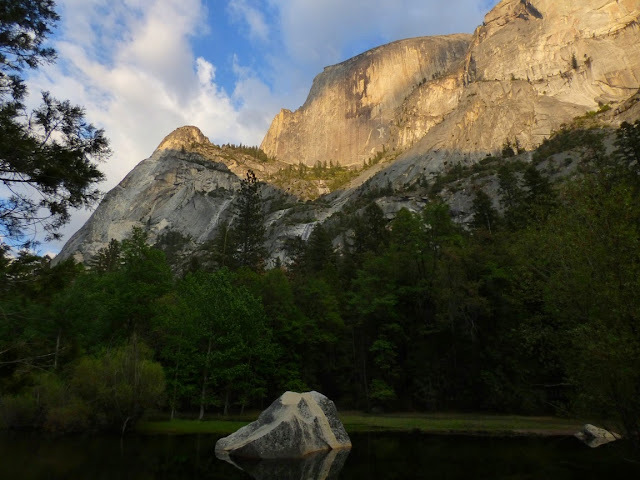 Rocks like El Capitan and Half Dome have very few joints, and thus stand out as a monolithic cliffs and peaks. The rounded shape of the dome is the result of exfoliation jointing. Exfoliation is the tendency to form slabs of rock parallel to the surface of the rock. Corners and edges are preferentially broken off, leading to the dome shape. The cause of exfoliation is still being researched, with a traditional explanation of pressure relief as the rock is exposed by erosion. More nuanced causes are related to thermal stresses and compressional forces within the rock. A rather stunning example of exfoliation in action was caught on film last year. Check out my post on the subject here: http://geotripper.blogspot.com/2014/09/ongoing-exfoliation-event-at-twain.html. Whatever the cause of the exfoliation and doming, glaciers did play a role in the unusual shape of Half Dome. A planar joint forms the face of Half Dome, and it was glaciers in the valley below that quarried away the rocks on the other side of the joint. Boulders and blocks of Half Dome Granodiorite can be found miles downstream in Yosemite Valley. Most visitors to Yosemite see the dome from the west, down in Yosemite Valley. Many visitors make the journey to Glacier Point or Washburn Point to gain a perspective from across the great chasm of the Merced River, and from an only slightly lower elevation. It takes just a bit of walking to Mirror Lake and the valley above to see Half Dome from the base. Somehow the dome looks huge from below. Such vertical cliffs are not immune from gravity, no matter how strong the rock. 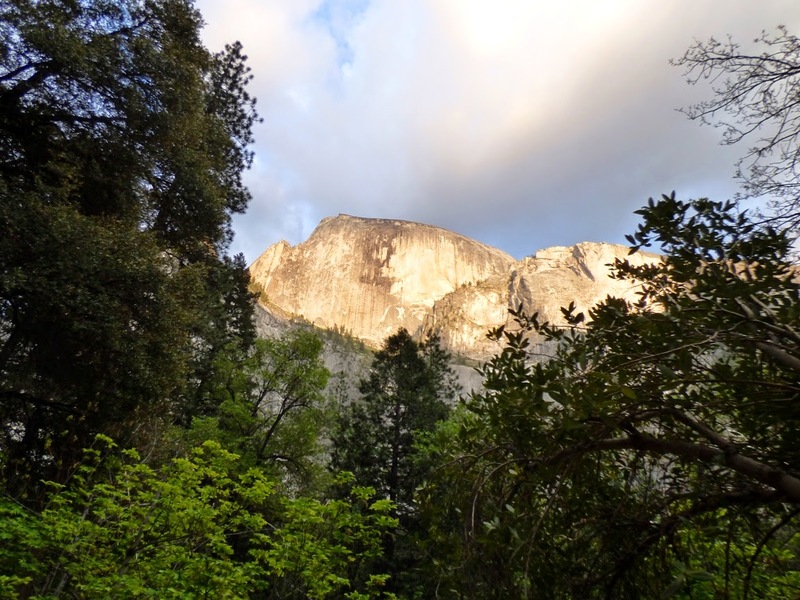 As noted in the last post, a huge rockfall came off the rock on the flank of Half Dome in March of 2009. 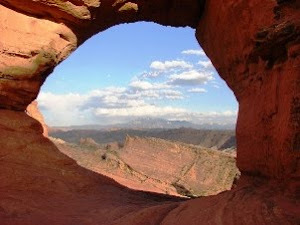 The Ahwiyah Point rock fall forever changed the appearance of Tis-sa-ack. But that's the nature of geology. Nothing on Earth remains the same, and some of those changes happen in a human time frame. Just ask the people of New Hampshire about their state emblem (story here). It isn't overly difficult to see Half Dome from the north. One needs merely to drive towards Tuolumne Meadows and stop at Olmsted Point. All of the other pictures in this post came from my trip last weekend, but the picture below came from one of the strangest journeys I ever had in Yosemite National Park. At the beginning of the current drought in 2011, practically no snow fell in November and December, so Tioga Pass was still open after New Year's Day in 2012. 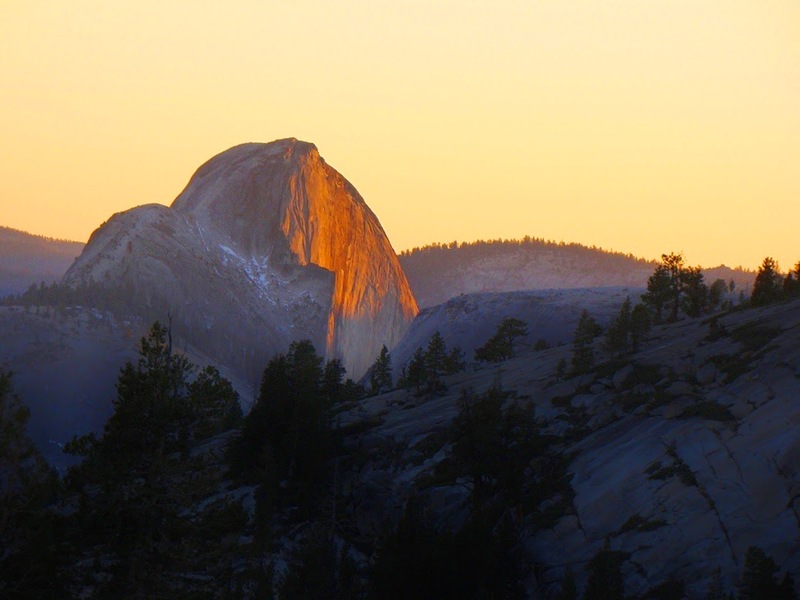 We went over the pass on January 5, and caught the sunset on the face of Half Dome. Catch some other pictures of that strange journey here and here. "Half Dome Granodiorite" ... so is this a distinct pluton? 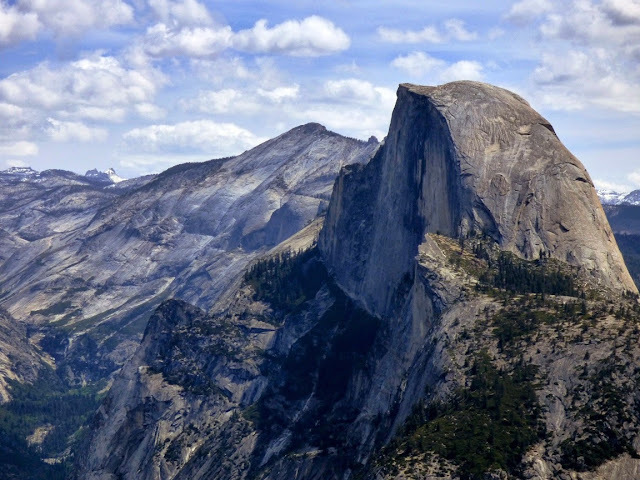 The Half Dome granodiorite is one phase of what is called the Tuolumne Intrusive Suite, a group of about five kinds of granitic rock that cooled from the same magma chamber. As it cooled from the outer edges, the remaining hot magma became more and more silica rich. The rock exposed in Tuolumne Meadows is lighter and richer in quartz. hey, thanks! 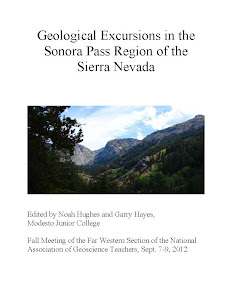 I was reading about the incredible accumulation of plutons in the Sierra Nevada in DeCourten's Great Basin book - that prompted my question. Sure would like to get back into the Range of Light. I was along the east side last week, with lots of beautiful views from the Owens Valley and the Whites. I will be out that way in a week or so.